Poet Patrick Carrington: She did. She made me realize that the poem was not only about my son, but also about me. When I wrote it, he was the only one I had in mind. I had almost removed myself from it. Anya’s rendering of the two of us sitting together with umbrellas sent me back to the text, and there I was, as close to him as the artist pictured. It also reminded me that he’s taught me as much as I’ve taught him. I see that in Anya’s art, that even when he was a boy, we were equals. Artist Anya Ermak-Bower: It came as a memory. Poet Patrick Carrington: Quite a few images ran through my mind. Puddles on city streets, rainbows and clock towers, until I made the decision to stop imagining, to wait and see. To let the artist do what she does best. I couldn’t be happier with the vision she came up with. It matches the poem like a twin. Artist Anya Ermak-Bower: It’s been raining a lot the past few weeks here. 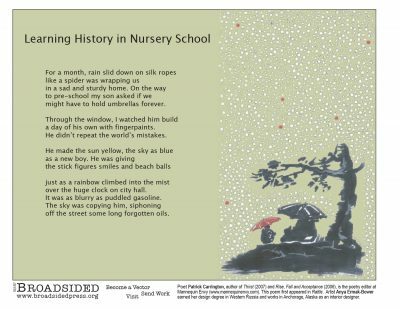 As mother to a three-and-a-half year old boy—a boy who loves his puddle boots and puddles—the poem and recent climate here have reminded me of being a child in rainy Lithuania, and of a child’s ability to enjoy the moment, regardless of the weather. Poet Patrick Carrington: How much I enjoyed my collaborator’s visual interpretation. I admit that I have never been much of a fan of illustrated poetry. I’ve always preferred to let words paint their own picture. But the grace of Anya’s vision, and those of many other Broadsided artists, have made me seriously reevaluate that prejudice. It’s opened my eyes to new light. Artist Anya Ermak-Bower: I was surprised by the immediacy with which I felt moved and possessed by the work. I saw the picture I needed to make and felt like it was imperative that I respond to the work with my art. If the broadside collaboration were a plant, what would it be? If this poem were a vehicle, what would it be? Artist Anya Ermak-Bower: Ummmmmm…should I say something here about alternative fuels? Poet Patrick Carrington: I’ve read a couple of poetry collections recently that have stayed with me in a haunting way. Tony Hoagland’s What Narcissism Means to Me, Bob Hicok’s The Legend of Light. I have The Eye Like a Strange Balloon by Mary Jo Bang, Broadsided’s September poet, sitting on top of my “to-read” pile. Artist Anya Ermak-Bower: The Birth Partner by Penny Simkin. It’s all about birth. I’m pregnant with our second child! Poet Patrick Carrington: I’m fortunate enough to be in reasonable driving distance of both New York City and Philadelphia. So yes, I have all manner of great art there for me any time I wish, and I try to take advantage of it. I recently saw an exhibit on Pop Art and Culture at The Philly Museum of Art, and there’s one right now on Abstract Impressionism, at The Met in NYC, that I’ll be taking in between now and Thanksgiving. Artist Anya Ermak-Bower: The Anchorage Museum of History and Art had an open house last weekend and there was a photo exhibit detailing an Inupiat whale hunt by Bill Hess. Poet Patrick Carrington is the poetry editor at the art & literary journal Mannequin Envy (www.mannequinenvy.com). His manuscript Thirst (Codhill, 2007), winner of Codhill Press’ 2006 Poetry Chapbook Award, has just been released (www.codhill.com). His poetry has appeared recently (or is forthcoming) in The Connecticut Review, The Potomac Review, Rattle, The Evansville Review, The New York Quarterly, Hunger Mountain, and other journals. Rise, Fall and Acceptance (MSR Publishing, 2006), his first collection, is available at Main St. Rag Press (www.mainstreetrag.com).